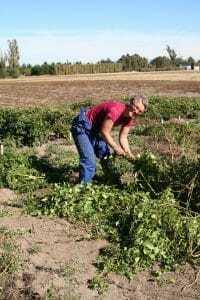 Plant and Food research have been studying the impact of different spray regimes on Tomato Potato Psyllid (TPP) populations in a series of small plot experiments for nine years. 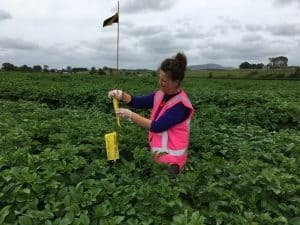 The latest series of trials have been conducted in commercial Waikato potato crops to investigate the efficacy of reduced insecticide programs in North Island potato crops. 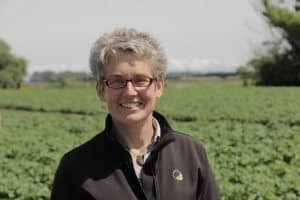 Plant and Food Research Mt Albert entomologist Frances MacDonald said ‘The research is looking at the use of oils as a “softer” control for TPP. In the farm-scale trials insecticide use was reduced in areas within crops, alongside standard spraying regimes at four sites in the Waikato. 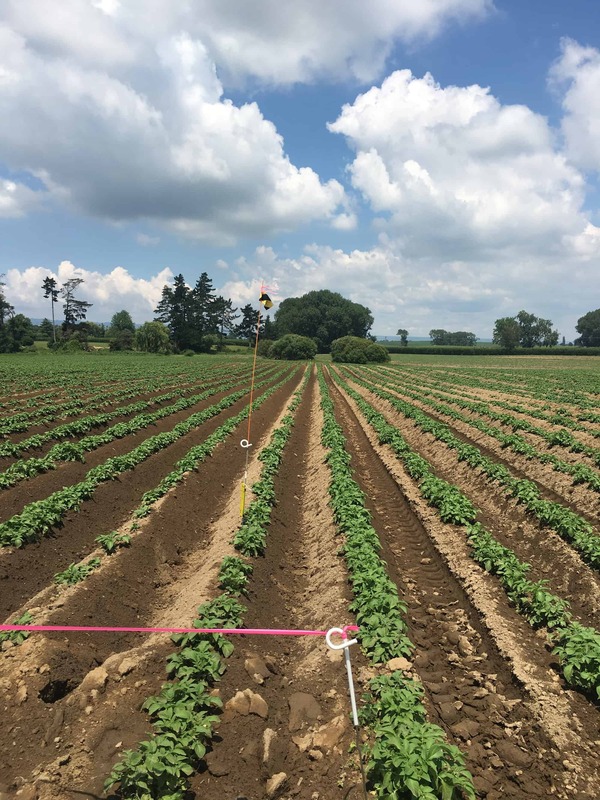 The three year trial conducted in commercial potato crops in collaboration with A.S Wilcox and Sons Ltd, has one more year to run. 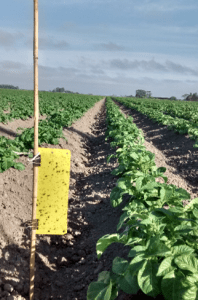 TPP populations were monitored using weekly crop scouting from potato emergence, and using sticky traps. Degree day information was also used to estimate the number of generations of TPP. “That is a long time for a crop to be in the ground and only have five insecticides on it,” said Ms MacDonald. There were no significant differences in yield or quality between treatments. “The first summer of the trial, TPP pressure was light however last summer it was quite significant so was a real test for the program. When the trial is repeated this summer it is planned that four larger areas will be used, compared with one large area and four smaller areas last summer. 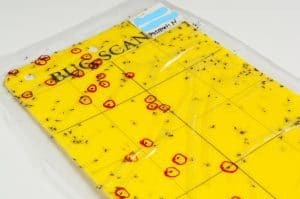 In terms of spray decision action-thresholds, the first insecticide was applied when an average of three TPP were found per sticky trap, and TPP eggs and nymphs were found during the scouting process in the crop, as well as considering degree days. The crop was a mix of process and fresh potatoes and all other management was for a standard commercial growing operation, said Ms MacDonald. A similar trial, using a reduced spray programme and spraying oil, may also be carried out in Canterbury next season. A TPP monitoring trial funded by Potatoes New Zealand was carried out in Canterbury last season. Plant & Food Research Lincoln scientist Jessica Dohmen-Vereijssen said the trial aimed to explore TPP seasonality, assess when Candidatus Liberibacter solanacearum (the pathogen causing Zebra Chip disease) positive TPP arrived in a crop or area, and identify any TPP or Liberibacter regional hot spots. Under the project, yellow sticky traps were placed in 10 crops in Canterbury as part of the Fruitfed monitoring programme. As well as TPP populations the traps also monitored aphids and beneficial insects. Five crops were Talley’s and five McCain Foods. Psyllids were collected from the sticky traps and composite samples of up to 10 were tested for Liberibacter. Psyllid samples which tested positive were then analysed to determine the genetic variant, or haplotype, of the Liberibacter pathogen. 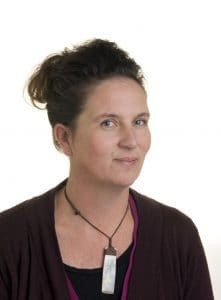 TPP were found on traps in all 10 crops, but not in as high numbers as a couple of years ago, said Dr Dohmen-Vereijssen. Peak numbers of TPP were caught between mid-January and early February. The first positive TPP sample for Liberibacter was on December 20. There were no TPP or Liberibacter hot spots identified. Crops will continue to be monitored in the 2018-19 season as will haplotyping of Liberibacter. This will be part of assessing the influence of the landscape on TPP ecology.